OK I will admit. I am an online dater. I have been for a while. When I say a while I mean for about 14 years I have been in and out of the world of online dating. Yep since I was 18 I have been looking online for love. I’m not ashamed of it. So how has my luck been? I have met some great guys and made some friends. It has been a bit of a mixed bag. I can safely say that I have never met anyone who I don’t feel comfortable with and I always go with my gut feeling. I follow all of the rules when it it comes to online dating. I don’t give out too much information straight away, I never tell them where I live and when we do the first meet it is always in a public place. Like I said I have been very lucky in that I haven’t met any looneys or such. There have been a few guys where I have gotten a bit funny about but the perks of online dating are that I have been able to cut of all contact with them. My first kiss was a guy that I had met online! How scary is that! Back when I was 16 I was the first of pretty much everyone with an internet connection. This guy was 15 and from Perth. I have no idea how we even got talking but it turned out that he was heading to my home town for a motor-cross thing and we decided to catch up. He was a lovely guy. His parents picked me up and we went to the movies. We saw the second Austin powers movie and that is where my first kiss happened! we kept in contact for a while but the distance was a bit too much. We found each other on Facebook a while ago and had a chat. It was good to catch up with him. Some of the people I have met and dated online have turned out to become quite good friends. I have a guy I met online and dated back when I was 19 who is still a good friend of mine and even became friends with some of my family who I still talk to today. Most recently I have been talking to guys online as a way to meet new people. Also to see if maybe I can find love. Being a single mum who has full time care of her child means that I don’t actually get out a lot. I probably go out a few times a year and they are for events so I don’t get the chance to meet guys the normal way. In the last few years I have met a few guys. Nothing of course that has tipped my fancy but there have been some. You never know one day I might find the love of my life online. I can say both my mum and dad found love online as well as a few other of my family members. So one day it might happen! 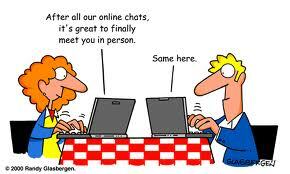 Have you ever online dated? Had any good or bad experiences? I would love to hear about them. I have online dated and I have to be honest, I hate it. There are too many creeps and weirdos out there and they all find me. I get the ones who ask me “can I paint your toenails?” to which I reply, no, I pay an asian guy to do that. I also get “get i buy you underwear?” Um, no, I like to buy that myself thank you. Then you get the cavemen who can’t answer an email using more than 3 words. UGH. I gave up. OMG… I do get the occasional weirdo but not offten.. Of late I have tended to get a few married guys looking for something on the side. They get shot down pretty quick. but I have to say I have not had anyone who has wanted to paint my toenails or anything like that!